Students at the University of Southern Maine work with composer Daniel Sonenberg on the production. GORHAM — Daniel Sonenberg’s new opera, “Girl in Six Beats,” which had its premiere over the weekend at Corthell Concert Hall at the University of Southern Maine’s Gorham campus, is one of the more unusual collaborations I’ve seen. 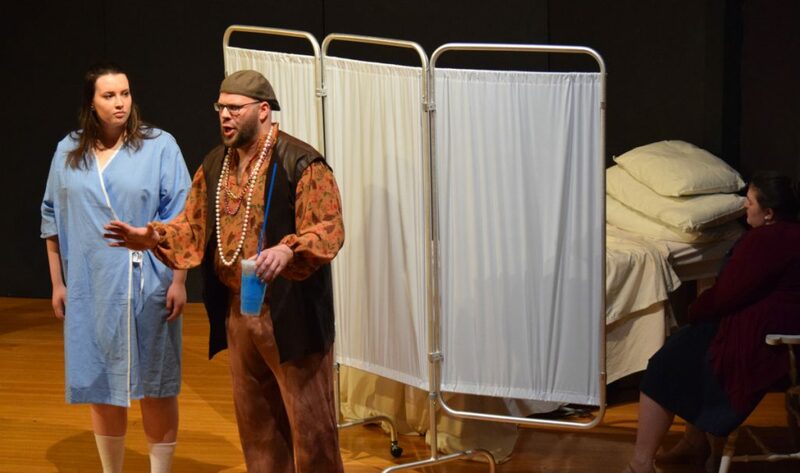 Commissioned by Opera Maine in a project meant to bring together several artistic and educational institutions, the work has a libretto by seven student authors, high school age or younger, created last summer at The Telling Room’s weeklong opera camp. Sonenberg, whose opera “The Summer King” had its staged premiere at the Pittsburgh Opera last season and who directs the composition department at USM, supplied a vocally and rhythmically challenging score. And the school’s Opera Workshop performed Saturday evening and Sunday afternoon (I heard the second performance) as the second half of a program that also included scenes from Mozart and Donizetti operas. The librettists – Emelia Bailey, Ella Briman, Makena Deveraux, Myah Garrison, Emily Greene, Zoë Sliwinski and Kaspar Wilder – produced a piece about a teenage girl who has attempted suicide and ends up in a coma, where she dreams she is in Limbo, a purgatory-like stasis in which two ancient beings, Reincarnation and Oblivion, debate her fate. A third Limbo character, Slushie Guy – a hipster who has been sipping a blue slushie, seemingly in perpetuity – shows her another alternative, namely, taking greater responsibility for her decisions and reconciling with her worried mother. Sonenberg’s music for the work’s four characters is attractive and melodic, but with plenty of odd-interval leaps and occasional meter shifts that ought to sharpen the student singers’ ears for contemporary vocal writing. The singers in the five main roles (there is also a six-voice chorus, which is called on to play percussion, as well) projected confidence and did a fine job bringing their roles to life. Rachel Shukan, who has had central roles in several recent Opera Workshop productions (including last season’s staging of “The Merry Wives of Windsor”), gave a smoothly polished, emotionally pointed account of the title role, to which she brought a believable blend of perplexity (during the discussions between Reincarnation and Oblivion), and teenage surliness (in her encounter with Slushie Guy). Nicole Ponte, as Oblivion, and Miles Obrey, as Reincarnation, were vocally strong, and endowed their characters with an arch, almost world-weary sensibility – we learn from Slushie Guy that they’ve been having the same debate for centuries – and a sense of irritation after Slushie Guy’s Beat 4 aria (the arias and duets are the “beats” of the work’s title) persuades Girl to fight her way back to life. David Myers was superb as Slushie Guy, bringing an attractive tenor sound and a good sense of irony to the role. And Christie Paul captured the intensity of the Mother’s worry, in Beat 1, and relief, in Beat 6, without overstating them. Ellen Chickering, who runs the Opera Workshop, directed the production and collaborated on the costumes with Katherine Leahy. Scott Wheatley conducted the performance from the piano. The same team also oversaw the opera scenes on the first part of the program. Overall, the scenes – from Mozart’s “The Marriage of Figaro” and “Don Giovanni,” and Donizetti’s “The Elixir of Love” and “Don Pasquale” – were staged with a sensible simplicity, and if vocal power and precision varied – the students who participated were at different points in their training – the young singers generally got to the heart of each scene.